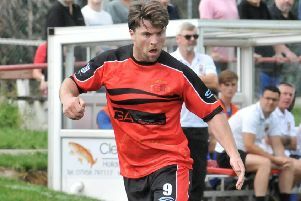 Garstang FC manager Lee Baker believes his players’ penalty success shows the strength of character among the Riversiders’ squad. Baker’s players reached the next round of the First Division Cup last weekend with victory in their fifth consecutive shootout this season. Having drawn 1-1 at Maine Road, Garstang eventually prevailed 13-12 on spot-kicks to set up a quarter-final at Avro. It was their fifth penalty victory so far in a season which has seen Garstang score 31 of their 32 spot-kicks. “It was pretty cold on the bench and I was pleased that someone missed in the end!” Baker joked. “It got a bit ridiculous and I’ve never seen anything like it but it took a bit of bottle and composure from the lads to take that many penalties and score; it’s certainly nothing to be sniffed at. “I have to be honest and say, when you’re on the bench and watching, you kind of feel that you’ve been here before and you carry on. Just as pleasing as the win last time out is a blank midweek, giving Baker’s players a chance to rest up ahead of a busy end to the year. Saturday’s trip to Chadderton is the first of eight games in December as they juggle league and cup commitments. “The simple fact is we’re through to the next round but it does leave us playing catch-up in the league,” Baker admitted. “However, we aren’t in a position where we can say we’ll concentrate on one competition over another. “I think we’ll be alright in the league; we know we aren’t going to win the league – we’re a long way off winning the league with the squad and injuries that we’ve got.